Fact or Fiction: Can Social Media Improve Customer Relationships ? While 86 percent of companies are comfortable marketing with social tools, only 41 percent use social tools for communicating with customers. Many organizations use social media for marketing, but not for personalized communication. So how social is social media, really, if there is no dialogue with customers? Customers perceive social media to be a means of getting great customer service, and they have high expectations. However, the reality is starkly different. Only 36% of consumers that make customer service enquiries via social media report having their issue solved quickly and effectively. Perhaps one reason many companies ignore customer complaints on social media is that it seems risky. Why add fuel to the fire by responding to critics publicly? If a conversation goes awry, you might attract attention for all the wrong reasons. Ignoring passionate critics is not a solution, either. If customers are not engaged through their chosen media, negative brand sentiment amplifies. The facts bear witness to this. When customer complaints are ignored on social media, 80% of customers later express frustration if they’re forced to make calls to a call center. Most companies have their work cut out for them, so what effective practices result in a superior customer experience through social media? When we began building our product, we asked ourselves what is now a common question: how do we deliver customer service through social media? Hootsuite develops a social media product, so our user base is mostly comfortable using social media. This meant that if a user wanted to contact us, it would likely be through social networks like Twitter and Facebook. At the time, there were few products—if any—focused on delivering customer service through social media, so we did what any company in our position would: We figured out what worked through trial and error. At first, we attempted to deliver customer service entirely through an in-dash widget. If customers required help, they’d click a tab within Hootsuite that said, “Feedback”. Quickly, we found this to be unsustainable. When users needed help, the tab wasn’t top of mind—and our customers preferred to talk over social anyway. Often, we used our Twitter account to talk to customers, but we encountered yet another problem: our customer service Tweets quickly drowned out our marketing Tweets. It was difficult disseminating news about features and initiatives when there was a new customer service-related Tweet every 15 minutes. Realizing we needed to separate our marketing and customer service-related communications, we created the @hootsuite_help Twitter handle. This required unique branding. Hence, we designed a “Dr. 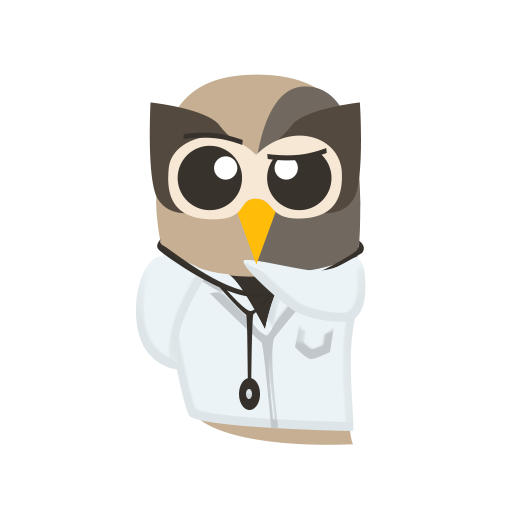 Owl” avatar, along with messaging that distinguished ourselves from our main Twitter handle. @hootsuite_help required proactiveness and vigilance. Whenever somebody tweeted to @hootsuite asking for customer service, we made sure to promptly reply from @hootsuite_help. As much as customers love using social media for customer service, social media is not a “one size fits all” solution for all problems. In our experience, social media works best when there’s a resolution within 1-3 replies of the initial inquiry. Because of character and formatting limitations built into Twitter and Facebook, a speedy resolution isn’t always possible through social media—especially when dealing with account-specific edge cases. As well, there are scenarios in which a resolution should not be attempted through social media. A good example of this is any problem that is billing-related. When dealing with matters of personal identity or credit cards, it’s imperative that if an inquiry is made through social media, companies find a way to funnel the conversation away from social. We therefore created partnerships with Zendesk and GetSatisfaction to make app directory plug-ins within the Hootsuite dashboard. These plug-ins create a seamless hand-off from social media to a customer service platform in an environment that protects privacy. The moment a customer reaches out to us through social media about a matter related to billing, we “pull” data from our Twitter conversation into a Zendesk ticket, and continue the conversation there. When we set out to deliver customer service to our users, we found a particular tool to be invaluable for building relationships with customers: our own product! If you have a customer service team of two or more customer service agents, using a customer relationship management platform like Hootsuite is invaluable. It allows you to keep track of which agent is speaking to which customer, when the conversations occur, and whether complaints have been resolved in a timely matter. We continue to build Hootsuite as a customer relationship platform. With our acquisition of Zeetl, we are in the process of integrating telephony solutions into the dashboard. This means that if a customer desires a resolution through a telephone call, social media can be extended through Internet telephony. Consumers expect customer service through social media. 52% of consumers expect a response within 30 minutes of their social media contact, but only 24 percent of service providers say they respond within that timeframe. It is time for companies to develop a social media strategy for customer service. Use social media to deliver consistent cross-channel customer support experiences. Provide proactive—not reactive—customer care to prevent PR disasters. Drive a more efficient support team to increase overall customer satisfaction.